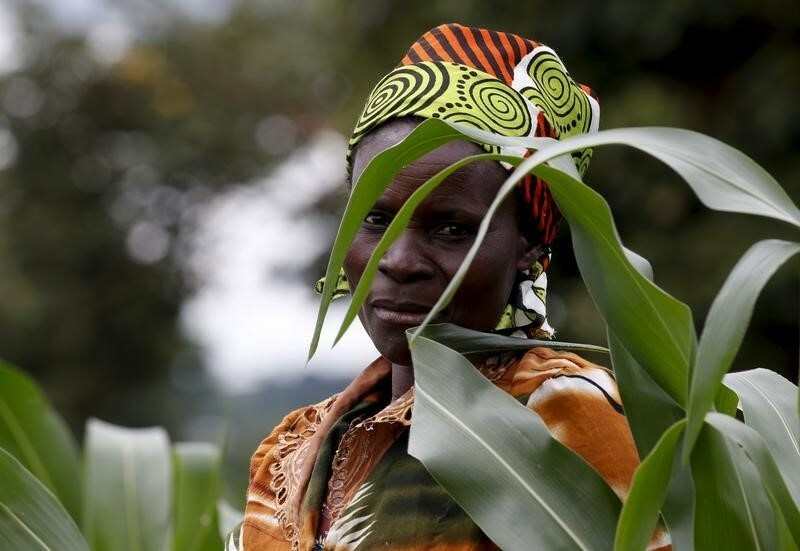 TURIN, Italy (Thomson Reuters Foundation) – As a young university student of agriculture, Edie Mukiibi believed the latest hybrid seeds which promised bumper crops were the answer to improving the lot of maize farmers in his part of Uganda. He persuaded many to buy the seeds, while working part-time promoting them in Kiboga district in central Uganda. But the consequences were “terrible”, he said. It was 2007, a year of drought, and the new seeds turned out to be less resilient than traditional varieties. “The farmers lost almost everything – every bit of maize crop they had. When I went back to talk with the farmers I could feel their pain,” Mukiibi said. Even worse, the new crops could not be grown with any other crops, so the farmers were left with nothing to fall back on except the bills they had run up for the pesticides, herbicides and fertilisers the maize required, he said. “This is when I started working with farmers … to diversify (their) farming,” said Mukiibi, now vice president of Slow Food International, a grassroots movement of farmers, chefs, activists and academics campaigning to improve the quality of food and the lives of producers. He said he wanted to help farmers use “local seeds, local knowledge, and traditional ways of managing resources”. Large companies are increasingly taking charge of food production in Africa and pushing for greater quantities of food – but these are not the answer to cutting hunger in Africa, he said on the sidelines of Slow Food’s annual festival in the Italian city of Turin which opened on Thursday. “We need to think more about the real causes of malnutrition in developing countries, and we need to realise the problem is not production, the problem is how do we keep the food we have in circulation,” Mukiibi told the Thomson Reuters Foundation. In Africa, food lost during or after harvest could feed 300 million people, according to the U.N. Food and Agriculture Organization. Mukiibi, who is based in Mukono district just east of the Ugandan capital Kampala, said people can go hungry in one part of Uganda while bananas are rotting in the fields and in stores in another part. “We need to encourage small-scale producers that they are still important in the world of food,” he said, adding that thousands in Uganda have lost access to land bought by foreign companies producing food for export. Reporting by Alex Whiting, Editing by Katie Nguyen. Thomson Reuters Foundation, the charitable arm of Thomson Reuters, that covers humanitarian news, women’s rights, trafficking, corruption and climate change.